We got to play with chocolate moulds today! Do you know that it cost so much just to buy 1 mould. I was told it is around $50-60 each! As the material is different from the ones that you get from the consumer retail store. 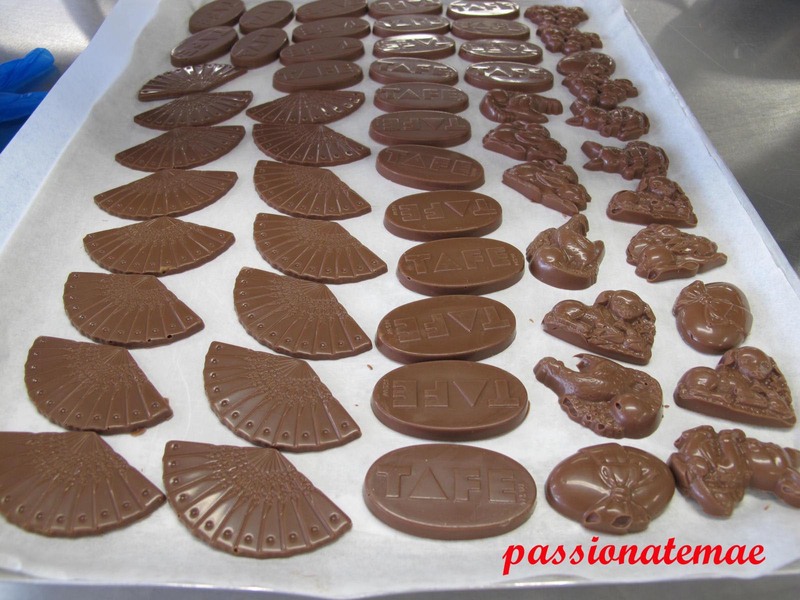 Every chocolate lesson, we have to temper the chocolates correctly before we can move forward. Otherwise, it'll be such a waste - Using an untempered chocolate means the chocolate doesn't set properly, and when it doesn't set properly it will not come off easily from the moulds. You'll end up with 3/4 of the chocolate stucked to the mould. Also, if the chocolate is untempered, fat or sugar blooms can be seen on the surface. Chocolate should look shiny, glossy and free from air bubbles. I chose 3 different types of moulds to make my unfilled chocolate moulds. 1. Make sure chocolate is tempered correctly. 2. Clean/Polish moulds with a soft cotton pad. We must never ever use detergent to clean the moulds but warm water and a soft cloth. 3. 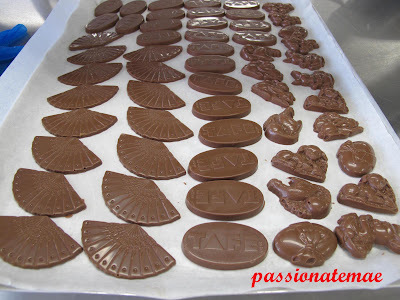 Fill up moulds with tempered chocolate from the center and spread to the sides. 4. Scrap off excess chocolate using a palate knife. 5. Vibrate the mould to remove all the air bubbles in the chocolate. 6. Scrap off excess chocolate again. 7. Leave it to set in the fridge just until the chocolate contracts from the mould. 8. Remove by turning it upside down on a clean bench. Use gloves to handle chocolate. Lesson 15: Novelty Chocolates & Happy Easter! !